If you are starting your journey in playing darts, you need to have a number of dart accessories that will make your game enjoyable. Many dart players concentrate on selecting the best electronic dart boards and forget that they need also need the best dart flights. Players who are new to the game might not have considered the different types of dart flights that are available. Selecting the right dart flight has a significant impact on your game. You should know that dart flights are available in different sizes, shapes and textures. So how do you know which dart flights suit you well? This is exactly what we will cover in our comprehensive guide and reviews to help you figure out the right dart flights. As a general rule, larger flights work well with heavier darts that have long shafts and suit people who do not throw hard. Small dart flights work well with lighter darts that have shorter shafts and suitable for people who throw harder. 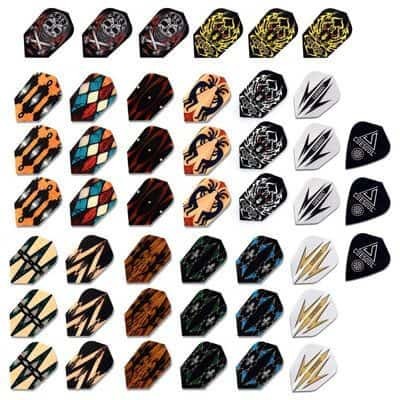 Let us have a closer look at each of the dart flights so that you can know the benefits of each model and choose the one that suits your needs. Now that you know that dart flights come in different styles, there are also different options on the market today. We dedicated our time on research to provide you with reviews of the best dart flights that will not break your budget. If you are new to darts, one of the challenges that many players face is choosing the right dart flights. What suits you might not work well for another person. This is why you should pick a dart flight based on your personal preference. Dart flights come in different sizes and shapes. 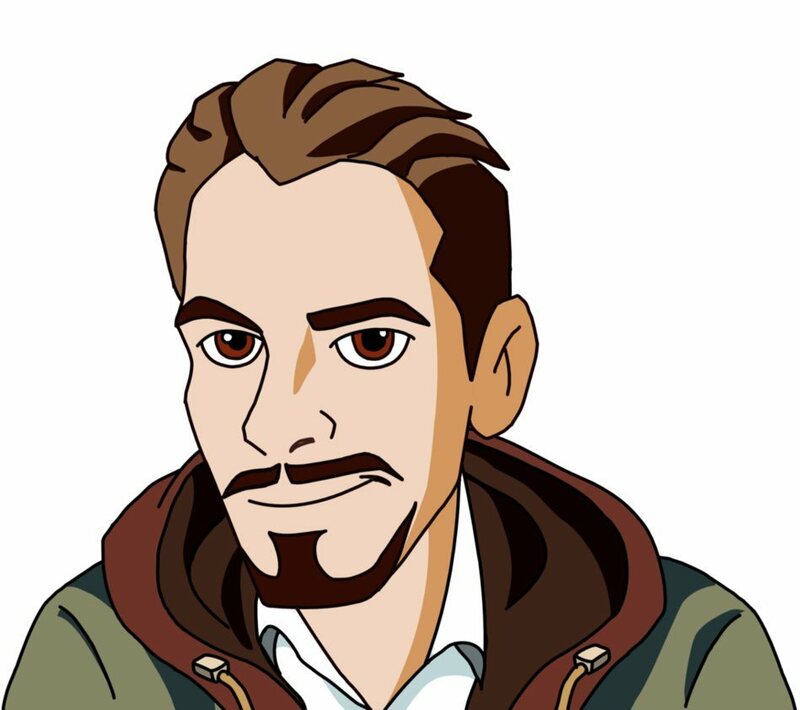 You should try different models to pick the one that suits your needs. 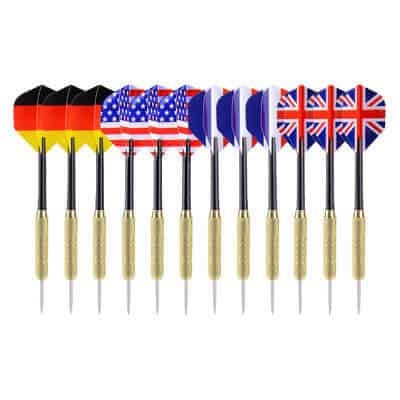 Ohuhu Steel Tip Darts with National Flag Flights work well and I would recommend them to avid dart players. These flights are designed for adult use only so you should not leave your kids unsupervised when they using the flights. They are designed with stainless steel, copper and PVC material making them long-lasting. The flights are perfect for people who are starting their darting journey. The copper-covered barrel provides you with a secure grip on the dart, thanks to the skid proof grain. These dart flights do not break with ease because they feature a strong construction. The PVC material ensures breakage doesn't take place. Moreover, the stainless steel darts work well with any traditional dartboard. The package includes 12 darts, 12 flights in 4 styles and 6 free PVD dart rods. You will also enjoy a 30-day money back guarantee and lifetime support guarantee. Many dart players shy away from buying wholesale dart flight sets because they are afraid that most of the packages feature low-quality flights. This can be true but it doesn't happen to all the packages. This is why I would like you to try the Long Life Durable Wholesale Nylon Dart Flights Sets that meet your expectations. When you are playing dart, you will experience many damaged flights. Therefore, you need this set of 20 packs that will help you replace the flights that get damaged in course of playing. These are durable flights that will offer you with a good service. They come in standard, slim and wide sizes and they are designed with a durable polyester material to provide you with a longer life. The good thing about purchasing this set is that you will enjoy different types of styles. As compared to other sets, this one doesn't include duplicates. You are not restricted to use these dart types with particular dart tips. They are designed to work well with soft tip darts and steel darts and they will offer good performance. Purchasing this set will not only save you more money in the long run but also give you the opportunity to enjoy high-quality dart flights that are rich in variety. If you are new to dart games, it can be pretty confusing to find the right dart flights. When I was a beginner, I tried different types of flights so that I would choose the one that suits my needs. I bought the 20 Sets Wholesale Standard Dart Flights and I can honestly say that these flights are the best. 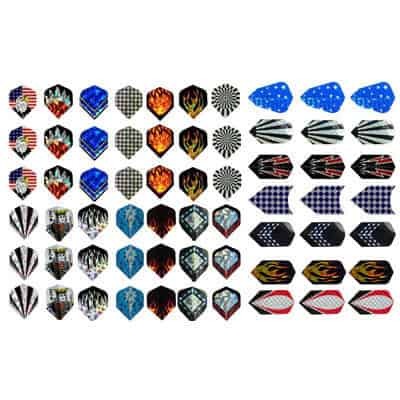 Buying this set will not only save you money but you also get 20 sets (60 pieces) dart flights that come in wide and standard sizes. These flights are from a reputable brand so you should not worry the quality. One of the main reasons why I love the flights is that they are perfectly assorted. Every set features a small bag for the wide and standard size. Please note that it doesn't include slim sizes. The flights work well with both soft tip darts and steel tip darts. Depending on your favorite, you can expect a good performance and enjoyable game with these flights. You will enjoy a wide range of designs with this set because it doesn't include duplicates. The flights are unique and any avid dart player would like to have them in their arsenal. 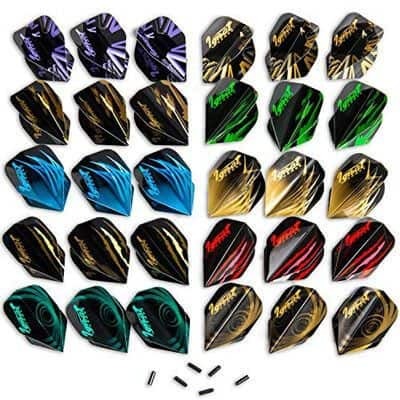 Get this wholesale dart flights that are durable and good looking. The fact that they are from CavalierDarts gives you an assurance of great quality. When it comes to choosing dart flights, many people hardly take it seriously. It is important to consider the type of flights you choose because they have a considerable effect on your game. 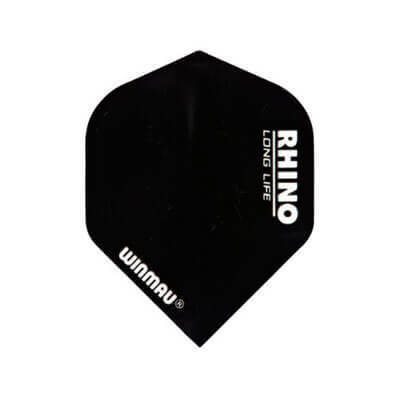 Get the Winmau Rhino Long Life Standard Extra Thick Dart Flights. The flights come in 3 sets of 3 to 9 flights. Not only are the dart flights durable but they also looks nice. As compared to other normal flights, I find them sturdy and thicker. 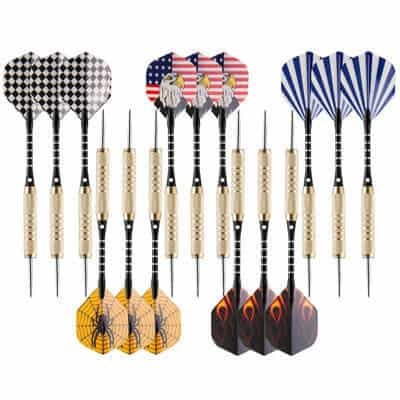 People pay attention in buying the best steel tip darts, dart boards and other darts essential. They regard flights as basic but the Winmau flights are way much better than the flights many people use. I have used a wide range of dart flights and I don't find a solid reason why you should not try these flights. They work well for different types of players regardless of your skills. The flights are extra thick and come in standard size. The price of the flights is reasonable so if you are just looking for some nice flights for non-competitive play, this model will be a wise pick. When you are selecting dart flights, it is important to consider the durability. You don't want flights that will not serve you adequately. These flights hold up well when it comes to durability so you should not be worried about their longevity. 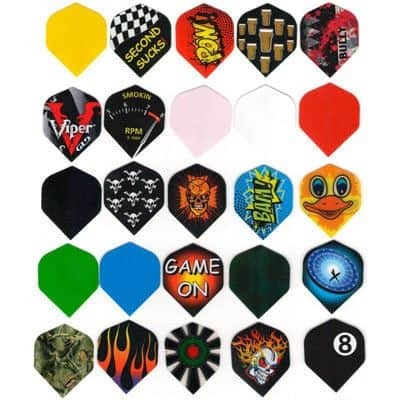 Having trouble finding the best dart flights for your game? Dart flights come in variations of styles and shapes. Therefore, you should pick the right one to ensure that you boost your game score. Champion Sport Co New 21 Sets works well for both beginners and young players. After using your darts, you will at some point need to replace the damaged dart flights. You can buy wholesale dart flights and enjoy different options at a relatively cheaper price. You will love this set because it includes many cool designs that you can select from depending on your preference. There are also a wide range of options for the slim and normal size. If you are teaching young players how to play darts, this can be a great set to buy. In as much as they are not the most durable flights on the market, they last long and do not get damaged quickly. Those who want to get more dart flights without spending too much money, this set suits you best. Not only will you save money but also get a variety of colors and shapes. The color and details of every flight is nice making it a good collection to have at a great value. I have used the flights and I haven't experienced any problems with them. 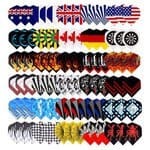 If you are new to the game of darts, you might be puzzled with the huge selection of dart flights on the market today. You should know the type of flight you choose will affect how you play. 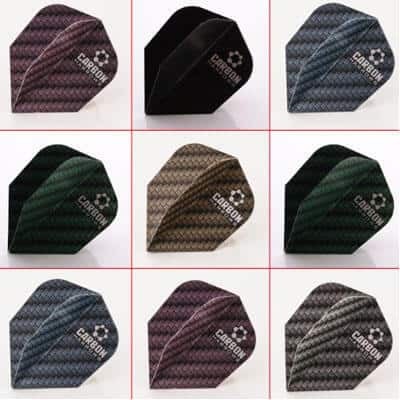 If you need quality slim dart flights, CUESOUL 15 Sets Slim Dart Flights Wholesale is ideal. CUESOUL is a well-known brand that not only provides you with dart flights but also other quality dart accessories that enhance your game. You can trust the brand for high quality darting items. Buying this set helps you enjoy quality flights at an affordable price. I bought the flights for my son and he loves them. They are great as compared to other flights he has used before. Players looking forward to competitive quality, you will enjoy using the 45 piece flights. It provides you with adorable flights and great value for your money. The flight material plays a huge role when it comes to durability. We all want to buy durable dart flights, don't you? This is you should get quality flights like the CUESOUL that are designed with durable polyester material. If you replace your dart flights frequently, this set provides you with many flights to choose from. They fit perfectly well and they are they feel sturdy. Whether you are a beginner or experienced player, you need to have several dart flights because they are consumable items. Have some sets as a backup will save you when you need to replace damaged flights. Ignat Games 30pcs Dart Flights is a great purchase to have in your dart items. These flights are designed with thick and resistant PET material that provides great balance. This ensures there is reduced drag and increases the speed of the darts when you throw. With these flights, it is easy for players to achieve a consistent flight path as well as true pinpoint accuracy. As compared to other conventional flights, the Ignat last longer. This dart accessory kit also comes with 2 sets of flight protectors that prolong the life of your dart flights. They protect the back of the flights to prevent them from damage from incoming darts. The protectors ensure that the flights are spread at 90 degrees angle and this helps to improve your game. You will also get a high chance of scoring better. Another thing that makes the set amazing is the fancy packaging. It makes it a perfect gift for dart lovers or beginner players. 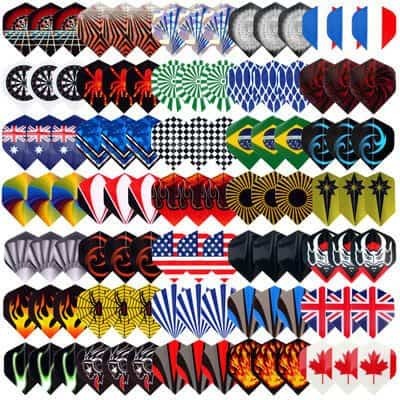 Additionally, the flights also come in unique patterns and look good. My wife plays darts and from time to time, she needs to replace her dart flights that get damaged by other darts when playing. On her birthday, I surprised her with the 5 x Mixed Sets of Harrows Carbon Dart Flights, and she is happy about the set. Previously, she had some dart flights that did not go well on the darts, and they split. This significantly affected her performance. However, she says that the new set of flights I bought her work well and they are great for any avid dart player. These flights come in standard shape and the price is reasonable. When you get these flights, you will enjoy great quality flights at a great deal. As compared to other conventional dart flights, this set feels thicker and sturdy. They fit perfectly and tight on the shaft of the dart without any problems. This set doesn't come in random mixed set. You will get 5 sets of the same color and type and they work well. In case you want to replace your old or worn out dart flights, having this set will be a great idea. In as much as you will not get so many dart flights in this set, their sturdiness will impress you. These are quality flights that do the job well and they maintain their shape even after playing many games. Finding a quality set of dart flights can be challenging work. In most cases, the wholesale dart flights set comprise some flights that are poor quality. Of course, you want to get quality flights at affordable prices without compromising the quality. If you have purchased dart flights that break with ease, you can consider trying the L.E.D STEP Dart Flights. These dart flights are durable, and they fit perfectly well on the dart shaft. When you are buying dart flights, it is essential to consider the type of darts that you have so that you can get the right type of dart flight. These flights are suitable for steel tip darts. 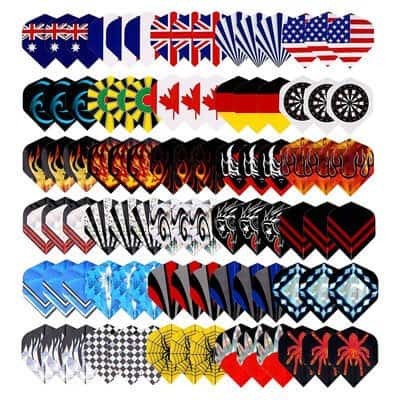 This dart set features 24 sets (72 pieces) of dart flights that come in different patterns and designs and no duplicates. To add on to that, the flights are designed with a quality nylon material that makes them durable. This set gives you plenty of dart flights at a reasonable price. So, if you are buying flights for your kid or beginner player, this set would be a great investment. The package includes a lot of designs so you have different options to choose from. The dart flights are great and they do their work perfectly well. After going through the above reviews, you might also feel it necessary to make a more personalized decision. Here are some important considerations that will help you choose the best dart flights that suit your needs. Standard- This is a nice shape for players who do not want much expectations. Slim flights- Same shape as standard but they are not wide. Kite- Great shape for people who want improved control. Lantern- Designed for players who want to boost the stability of the darts while maintaining the tail down. Teardrop- Offers a total lift from a smaller area. No.6 shape- Common among many players and they provide stability and maximum lift. Apart from the shape, you also need to make considerations when it comes to the size. It is important to note that smaller flights can lead to less drag making the darts to move quickly through the air. On the other hand, larger flights have an opposite effect. If you have a gentle throw, go for larger flights. The weight of dart flights affects the overall dart weight. Heavier darts are durable and their spread is not compromised with time. Here is a list that sorts flights from the lightest to the heaviest. You should also have the price in mind when you are buying dart flights. You can get flights in different price ranges and some packages come with many pieces. If you go for the wholesale option, you might get low-quality flights because they are made for social use. If you are looking for a professional package, a budget of 30 bucks can give you quality flights. If you are a casual or a semi player, you don't need to spend much buying dart flights. Between 10-15 bucks will give you better performing flights. This is another important consideration to make when buying dart flights. In as much as many people overlook it, it is equally as important as the shape and size. Having a smooth dart flight reduces drag while a textured flight increases the drag. If you have experience in playing darts, I believe you know whether you need a larger or slim flight. But if you are just getting started, it can be tough to know the best dart flight to choose. There are different styles, sizes and shapes to choose from which can be overwhelming for starters. We made this detailed guide and review to provide you with relevant information that will help you select the most suitable dart flights. After comparing the reviews of our top 10 models, it will be easier for you to fish out the flights that you want based on the features that you are looking for. We have reviewed high quality dart flights that are not only great for beginners but also experienced players. On top of that, we included a guide that highlights some important considerations you should check when picking the right flights. We all these resources, it will be pretty easy for you to make a wise decision and enjoy your game.